There was a time, not too long ago, when the Bushwick section of Brooklyn was known for its embattled streets, and those who could decamped for safer places to live. Shops were shuttered, homes abandoned. It was not a place anyone would consider living. But now, children of those expatriates are coming back. Gaggles of them, opening up (and patronizing) candlelit restaurants, art galleries and oh my gosh, gentrifying this heretofore decaying neighborhood. But no neighborhood rising from the ashes earns trendsetter-cred until a funky boutique hotel opens in its midst. 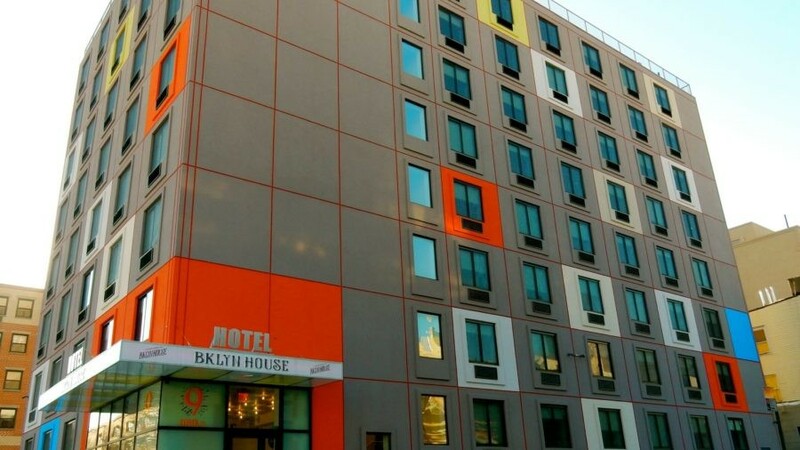 And so, I present, BKLYN House Hotel, where “provocative street art and fine art live side by side.” For travelers with a sense of adventure, and who are perhaps visiting friends or family nearby, the 116-room BKLYN House offers a clean, artsy, loft-like, “stay local” option over a commute back and forth to Manhattan. A black and white Keith-Haring style mural in a small contemporary lobby depicts all neighborhoods in Brooklyn with a red “You Are Here” pin for Bushwick. This sets the tone for what seems like a very upscale hostel (if hostels had pillow-top bedding and Paul Mitchell amenities) next to shuttered stores and graffiti-spattered construction fences (with new buildings sprouting all over the place). The Business Center, several desktop computers, printers and fax machines a few steps down from the lobby, also serves as an ersatz art gallery – representing local work with a Brooklyn theme. 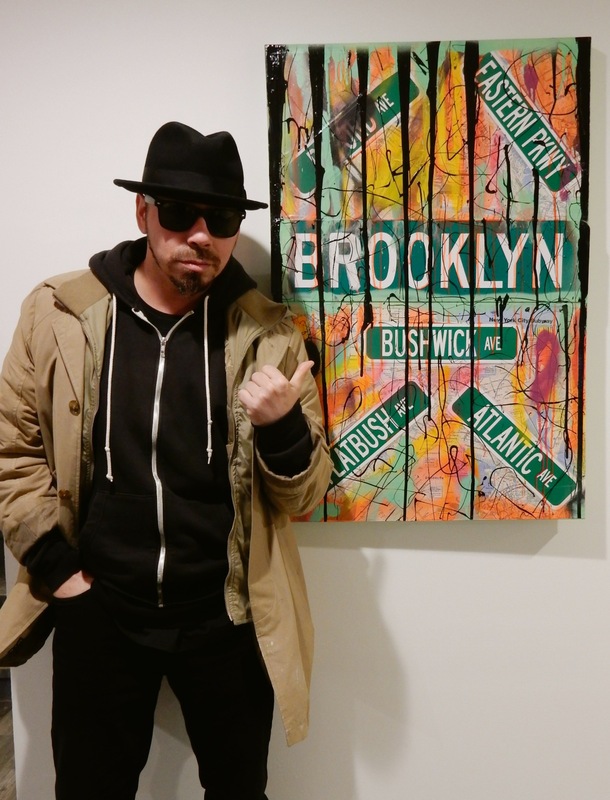 Every piece of art, like the street sign pop-art by upbeat Bushwick-booster and exhibit curator, Savior Elmundo, somehow references this borough of NYC, from realistic maps to abstract Jackson Pollock-like representations. 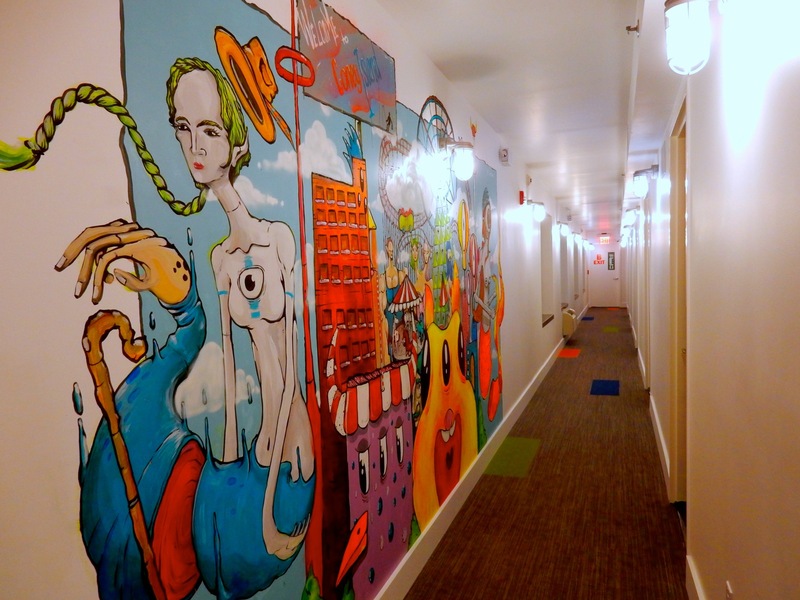 Each of eight floors features it’s own funky to fab mural, done by eight different artists, depicting most Brooklyn neighborhoods. To see them all, begin on the 8th floor (a psychedelic Coney Island) and work your way down (Red Hook, Crown Heights, DUMBO, Fort Greene, Flatbush, Bed Stuy) for maximum effect. 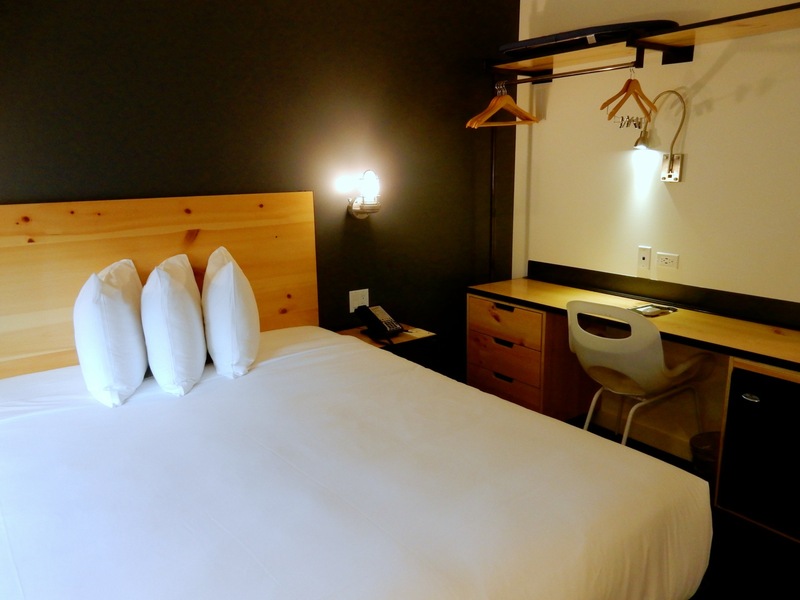 Smallish rooms sport dreamy pillow-top bedding – with some of the softest sheets I’ve ever slipped between – dark walls, industrial wire-cage wall sconces, simple pinewood desks with clothes racks above, and large flat screen TVs. 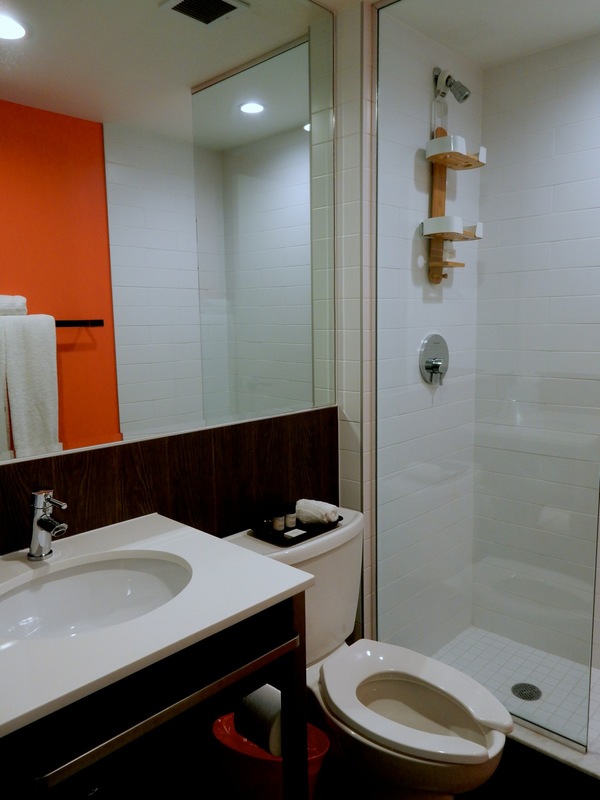 The bathroom is delightful – gleaming with white subway tiles, glass shower, and punched up with one bright orange wall. For all the rustic-Brooklyn sparseness of the bedroom, the bath is top-of-the-line modern. You’ll find “restricted” views of downtown Manhattan from the upper floor rooms, though they may be completely obstructed by a proliferation of new construction nearby. 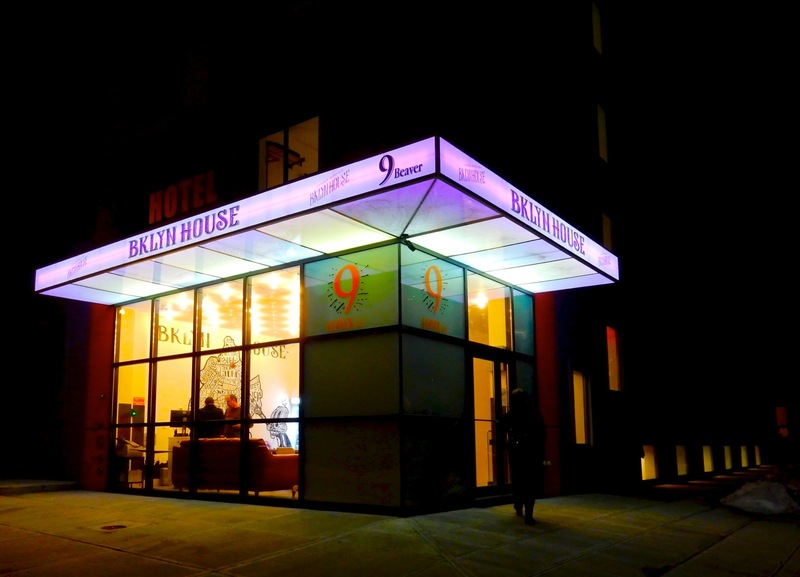 Better to look inward and think of BKLYN House as a Museum of Emerging Art and gathering place for experimental artists, rather than expect the type of vistas you’ll find closer to the East River. Room rates include an expanded Continental Breakfast, with baked goods, fruit and cereals. 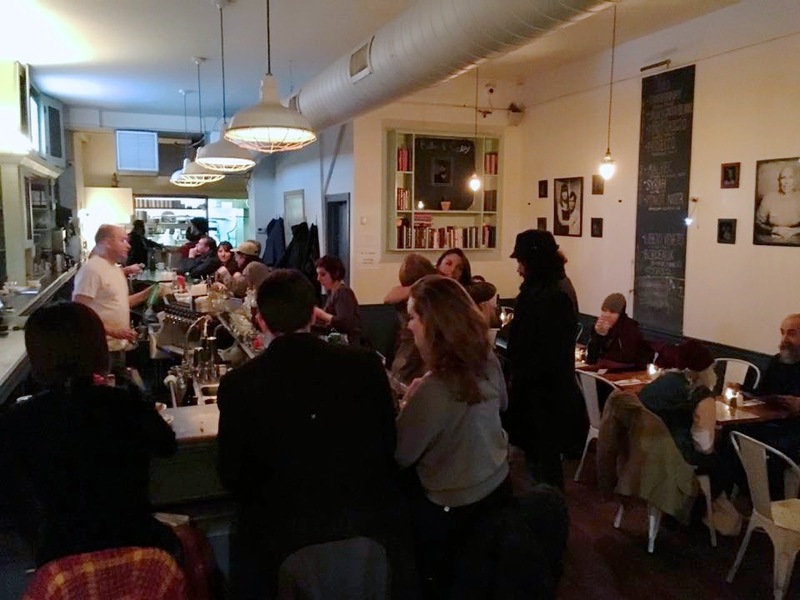 You’ll have to take a walk in the neighborhood for lunch or dinner – and the first decent restaurant you’ll come to on Flushing Ave. is 983- Bushwick’s Living Room, a cute candle-lit American Comfort Food eatery. Surprisingly, even on a Tues night in freezing January, the place is packed with well-dressed young adults, drinking signature cocktails and feasting on Buffalo Chicken sandwiches, from scratch meatloaf, and other hearty dishes. 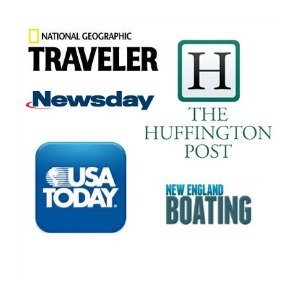 Mid-Week off season, rates go way down – some to $75 per night as a “soft-opening” price. Figure on $120-$150 per night, which includes breakfast, wi-fi, fax, and daily newspaper.